Dizzy Doll is a wholesome, family friendly pinup. She dedicates her time to uniting pinups all over New York, and raising money for multiple charities across Long Island while doing so. On top of being a wife and mother to 3 wonderful children, she also owns her own business, Beauty Set Apart, making beautiful and unique hair accessories. Dizzy aspires to spread kindness and be a positive role model to everyone she meets. Jessie Leigh has been in love with vintage items, pinup babes and music from all eras since she was very young. One of her many pastimes, is finding the best antique stores and trying to not buy everything that she falls in love with. She also knows how to sling some drinks and create some creative cocktails. Mixology is a pure artand something she constantly is practicing. So if you need any help on a crafty cocktail, she’s the girl to ask! Miss Clara Button has been in love with vintage style since she first saw 'Gentlemen Prefer Blondes' in 2007. She began collecting and wearing vintage clothing and sewing dresses with vintage patterns. She spends her days creating custom vintage inspired clothing for retro-loving gals around the world. She also enjoys thrifting for vintage fabrics and baubles. Allie Kelly is a bubbly blonde from Long Island! She is a hairstylist extraordinaire who loves to see a smile on peoples faces when they leave her chair. Allie spends her free time advocating and being the voice of dogs with Pinups For Pitbulls, which led her to being a brand ambassador and Miss February 2019 in the Pinups For Pitbulls Calendar! board game nights with her friends.Amanda Huginkiss is an accomplished pin-up model / pageant queen /actress with a passion for vintage style, fashion, and entertaining. Shehas appeared in multiple horror movies, music videos, television series, live performances, publications, advertisements and fashion shows, often wearing her own unique designs. Amanda has also won several pin up pageant titles including 2017 Miss Nashville Boogie and 2017 Miss Asbury Park and many more. In her down time Amanda does charity work for New York Wounded Vet Run play bass and enjoysboard game nights with her friends. Ms. Scarlett Rose is from Long Island NY. She is an RN who specializes in Emergency Medicine. Autism holds a special place in her heart. She is an advocate and warrior for those on the spectrum. Her love of vintage goes back to her childhood with a strong influence by both hergrandmothers. The Pinup lifestyle naturally followed later on. In her free time she enjoys live music,car shows, hot yoga, camping and being with those she loves. 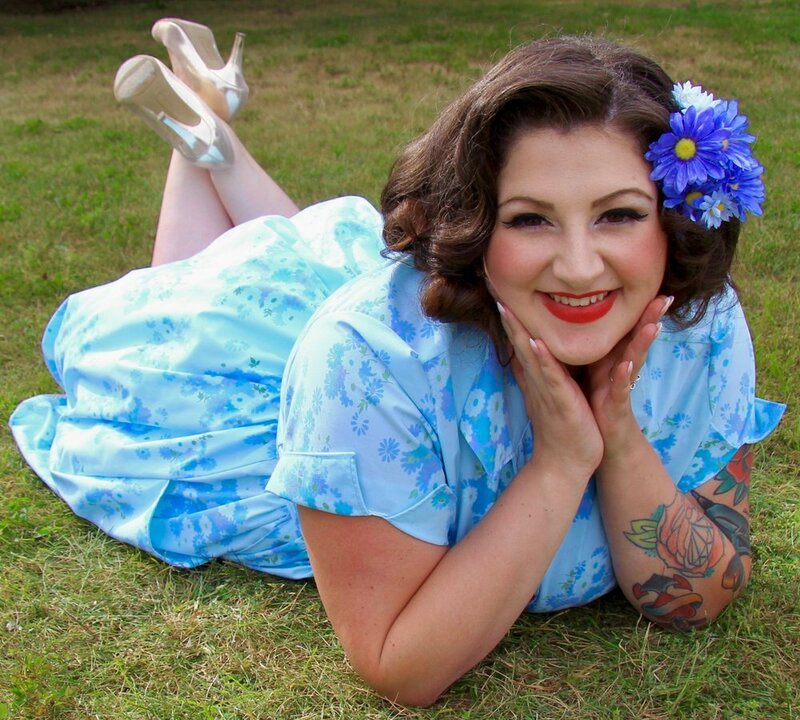 Ms Amie Kitty is a Long Island based Pinup, mother, and mental healthactivist. She credits pinup and retro living for helping her beat depression, and uses her public platform to educate against stigma, and help those who are struggling as much as she can. Jamie is a dog-loving critical-care RN who’s interests include live music, travel, and hot cars. Her passion for pinup culture is such that some say she was born in the wrong decade. Long Island girls around town!